We love to stop at Visitor Centers. They are usually staffed by helpful people who are not only excited to tell you all about where they live, but they'll clue you in on the best things to do depending upon your interests. That's how we found out about East Sooke Regional Park on Vancouver Island. Described in the literature as having "mystical pull" and challenging coastal hikes along rugged coastline in a wilderness setting it delivers on its promise. We've spent the last two days hiking in the park and it was spectacular. The first day was from the East entrance by Beecher Bay and Aldridge Point. Fairly easy going. The second day, from the West on the Pike Road trail to Iron Mine Bay and along the Strait of Juan de Fuca was a challenge and lived up to the "rugged coastline" description. The scenery is jaw droppingly beautiful, from the "mystical" fern filled forest trails to the cliff hanging rocky ledges. If you ever get the chance, go! We call it a "Madrone" tree, but believe it is called "Arbutus" here in Canada. Whatever it's called, the peeling bark begs to be photographed. This gives you an idea of the West side trail. Colleen only fell once! We’re stuffed…we came across the map of Vancouver’s Best Street Eats and we’re hooked. Holy guacamole Batman, good food, reasonable prices, alfresco dining in the heart of the city – no wonder food trucks are all the rage in big cities across the country. 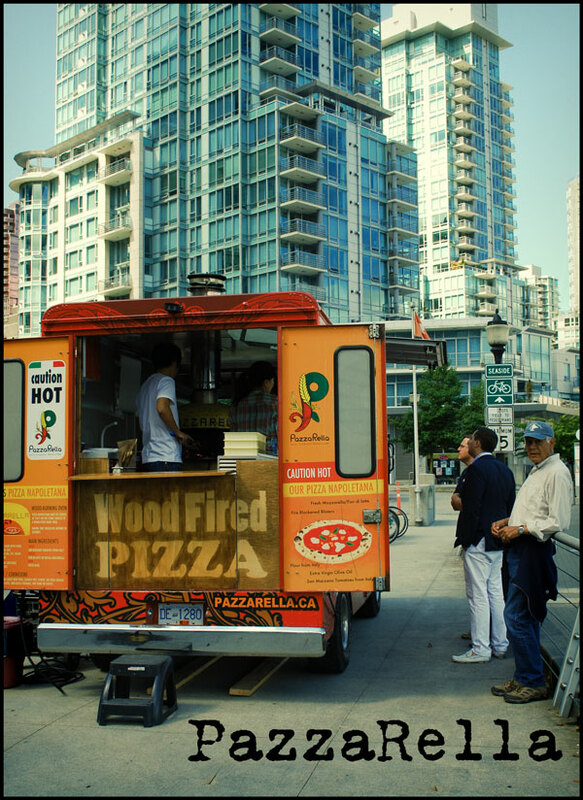 For your own Vancouver food truck extravaganza, download the Vancouver Foodie Tours map with a listing of locations, menus and websites at http://www.foodietours.ca. Let us know what you liked best! If all this talk of food trucks is stirring up a longing to try your own hand at this type of venture, check out this site http://www.carinsurance.org/food-trucks for some helpful information on the food truck business. Did you know that Vancouver's Stanley Park is larger than New York's Central Park? It's huge...we know because we biked the park's perimeter seawall path today. A myriad of views appear around every bend for 5.5 miles. Vistas away from shore include Vancouver's skyline across Coal Harbor, the Lion's Gate Bridge leading to North Vancouver, and English Bay Beach on the Puget Sound. Looking to the interior of the park, the bike path views are just as spectacular. Ferns, Rhododendrons and more than half a million trees, some hundreds of years old, surround gardens, First Nations totem poles, the Vancouver Aquarium, the Tea House and the Lost Lagoon. The Stanley Park seawall has to be one of the most beautiful (and easy) bicycle paths anywhere. And while that is a personal opinion, it's worth noting that the park has been named 16th best park in the world and 6th best park in North America by the Project for Open Spaces so somebody must agree with us! Nope, we're not in Italy - yet! That's next April and something we are so looking forward to. It is one of those plum assignments that we hoped we'd find when we thought about becoming house sitters. But in between dream locales, there are places like Richmond, where we are now. It's a place that people describe as being "great to live in because it is close to everything..." We think that say's a lot! We’re water people. Drawn to the water – primarily the ocean, although a pristine lake or snow fed rushing river will do in a pinch! This tendency often leads us to beaches, boardwalks, seawalls, docks, shipyards, boatyards, locks, fish ladders and marinas. Like bloodhounds we get a whiff of that distinctive briny, fresh, ocean aroma and we are off and running, following the scent to the water’s edge. When we heard about Richmond’s historic seaport along the banks of the Frasier River we succumbed to instinct. The Britannia Shipyard is on Canada's National Historic register and is staffed by volunteers and city workers who fight against time and the elements to preserve British Columbia’s oldest seaport. The seaport’s plank boardwalks were the “sidewalks” of the day for an entire town built on stilts. From the 1880’s to 1900 Salmon thrived in the Frasier River and Chinese, Japanese, European and First Nations people made a living catching, canning and exporting them around the world. They built homes, shops, schools, churches and canneries and lived their daily life all above the changing tidal activity of the mud flats. The day we visited the “Kaisei” was in port for the annual SeaPort Festival. At 151 feet long, with two huge masts, she is an impressive vessel. Crewed by volunteers from 26 nations, she’s visited 15 countries on peace and goodwill missions. Sounds like a great volunteer gig to us – where do we sign up? House Sitting and Caretaking - What's the Difference? People are often confused when we tell them that we are house sitters. Frequently, they mistakenly think that we are talking about house trades whereby someone exchanges their home with another person. Why they usually jump to this conclusion we're not sure - maybe because house exchanges are more main stream and house sitting is relatively not? Another misconception people have revolves around the difference between house sitting and caretaking. In general, house sitting involves taking care of someone’s home with the same care that you would your own. The routine daily chores such as cleaning, taking out the trash, mowing the lawn, doing some weeding, watering plants, bringing in the mail and responding to an unforeseen maintenance issue in an appropriate and timely manner can all be part of the house sitting responsibilities that the homeowner entrusts to you. Special requests may be made as each homeowner has their unique needs but, in general, your obligation is to be a presence in the home and maintain it to the standard in which it was presented to you. Many homeowners have pets and house sitting often involves their care - feeding, walking, bathing and, in some cases, giving medications. You may receive compensation for your service or you may not. The majority of house sitting positions are unpaid. The Caretaker’s Gazette, a print and on-line newspaper, advertises caretaking positions that range from the standard house sitting duties mentioned above to full time estate management that pays in excess of $100K a year. Many times caretakers are given a place to live either seasonally or for a longer term in exchange for a specified number of hours of labor they must provide during their stay. Some caretaking positions offer nominal pay in addition to accommodations. We've seen a few ads that even offer benefits! Do you need an edge over the competition when it comes to writing your on-line profile? Ask yourself - what is the homeowner's main concern and how can I address it in the best way possible? One thing we learned early on is that while homeowners are looking for a house sitter to provide a secure presence in their home, their major concern, if they have animals, is to find a house sitter who will provide quality care for their pets. If pets are involved you will have a better chance of being selected for the sit if you have a recognized certification in pet first aid training under your belt. This training typically includes managing urgent care situations such as accidents, wounds, electrical shock, and eye, foot and ear injuries as well as being able to recognize the symptoms of illnesses and poisoning. Courses are provided by the American Red Cross (ARC), the National Association of Professional Pet Sitters, and the Humane Society. The availability of courses varies by geographic region. We opted for the ARC training course and we were happy that we did. We've always had pets and pride ourselves on being good caretakers, but the training gave us more knowledge and self confidence in addressing a wide variety of situations. It also shows the homeowner that we are serious about our role as surrogate "parents" and truly concerned about providing the best care we can for their beloved pets. Two weeks turned into three before we knew it...and all our good intentions to post were set aside as we took a road trip, a cruise, and settled into our latest house sit in Richmond, British Columbia. In our defense, we didn't have internet on the cruise - well, we could have but we refused to pay .65 cents a minute for it! Mount Rainier certainly lived up to its reputation - massive, deceptively dangerous and mesmerizing. We were lucky to have the most beautiful day to enjoy the park and a clear view of the mountain as you can see. Wildflowers bloomed in abundance, clear rivers sparkled and we lost count of the waterfalls. Glorious. The Alaska cruise with its stops in Skagway, Juneau and Victoria was so much more enjoyable than our first try at cruising Alaska a few years ago when it rained buckets every single day. Sawyer Glacier was worth the 5:00 a.m. wake-up call and rivaled Mount Rainier in sheer natural beauty. We cruised along on milky green glacial water while watching blue ice bergs float by...dreamy really. Our other ports of call in Alaska were Skagway, the gateway to the Klondike gold rush and Juneau, the capital of Alaska. Did you know that you can't drive to Alaska's capital city because there are no roads to Juneau? to be traversed by each miner with 2000 pounds of supplies to reach the Klondike.